Gerrit Jan Bossen, President of GAC-EPA, opened the 2014 Annual General Assembly (AGM) which took place this year from 14:00 to 16:30 in the Main Auditorium. He very much regretted that due to an error, the English version of the Invitation to the AGM was sent out much before the French version. He welcomed the 270 or so participating members, thanking them for attending, to whom should be added some 94 members represented by proxy. He pointed out that this year, like last year, the meeting can be followed live by webcast; this allows our ESO colleagues and anyone else who cannot attend the meeting to be able to follow it on the internet passively but without being able to vote. ￼￼￼￼￼NB: however, after the meeting we discovered that the webcast had not taken place for reasons unknown. The Committee very much regrets this and is extremely sorry. He then paid tribute to all those retired members who had passed away since the last AGM and invited the audience to observe a minute’s silence in their memory.￼ ￼￼￼￼NB: The list of deceased members since the last AGM is projected onto the screen. The President proposed Bernard Ducret, editor of the Bulletin, as Chairman of the meeting, and this was unanimously adopted. The President also pointed out that following the recent March meeting of CERN Council, the Report on the 2013-2014 Activities would be preceded by an important issue concerning the Pension Fund and by a presentation of a Joint Resolution AP/GAC-EPA which would be put to the Assembly for approval. Extracts from the presentations used by the speakers are repeated here; you can also consult the full set. Bernard Ducret, Chairman of the session, welcomed the audience and proposed the adoption of the Agenda to include the change mentioned above by the President. The modified agenda was adopted unanimously. Bernard Ducret asked if there were any remarks to be made on the 2013 AGM Minutes; there were none. Therefore, the Minutes of the AGM of 27 March 2013, were approved unaminously. As a small reminder, Gerrit mentioned the package of balanced measures decided in 2010/2011 to improve the Pension Fund by a concerted effort of staff members, pensioners and the Organizations (CERN and ESO); these measures were to allow for a 100 % coverage rate of the Pension Fund in the year 2041. He then gave a summary of recent events initiated in autumn 2013 by an actuarial report from the new actuary of the Pension Fund (Buck Consultants), in which, by adding unverified assumptions, the study did not correctly take into consideration the measures quoted above and because of this resulted in the funding level being extremely disadvantageous; under the pressure of the Delegations, this report (even before the Pension Fund Governing Board had expressed an opinion on its validity) had already been presented during the December 2013 Finance Committee and the CERN Council meetings. One Delegation had reacted sharply (dragging in its wake several other Delegations) deeming that urgent new measures must be taken; the Delegation in question sent a relevant letter to the Council along with a memo of questions and considerations on which the actuary should give his verdict. This document challenged the package of measures already negotiated and hinted at an increase of contributions by staff members but not by the Organizations, an increase in the threshold of the non-indexation of pensions from –8% to –15%, and the suppression of the special contribution of the Host States. In the light of this situation, the CERN Staff Association and the GAC-EPA have reacted briskly by sending a protest letter dated 30th January 2014 to the President of CERN Council to denounce with force the disrespect of previous agreements and procedures ruling the governance of the Pension Fund; it was also envisaged to inform the staff members and pensioners about the preoccupations produced by this irresponsible attitude of the delegations with a brief article in the Echo and by publicly exposing the letter from the instigating Delegation as well as the memo of questions and considerations mentioned earlier. Nevertheless, the PFGB took matters in hand by inviting the actuary to reconsider his report so as to include in the final version of the actuarial study the realistic hypotheses and especially the balanced measures decided in 2010/2011; it was agreed then to delay our action until this version of the actuary’s report is terminated and to wait for the reactions of the Delegations when the report was presented during the March 2014 meetings. However, although the final actuarial report had finally concluded on a healthy situation of the Pension Fund in the year 2041, the instigating Delegation did not change its position and sent a proposal of a resolution to the CERN Council, challenging the notion of acquired rights and demanding an independent study ignoring the previous agreements. The Finance Committee accepted the new actuarial report but Council did not follow it, and without formally approving the resolution, declared it necessary to make new studies of the Pension Fund in order to take a final decision in the June Council. NB: Gerrit recalled that this profusion of actuarial studies will lead to an explosion of expenses to be paid to the Actuary (at least 7 to 8 times more than the 100 kCHF foreseen). How can we react to this attack on our pensions? Gerrit gave the floor to Michel Vitasse so that he could explain what has been decided jointly by the Presidents of the Staff Association and the GAC-EPA, after examination of the situation by the members of the Pensions Commission. Michel recalled that it is only the 2nd time in the existence of CERN that CERN Council has not followed the recommendations of the Finance Committee. Michel then read the following Resolution to the Assembly, adopted this Wednesday morning by the Staff Council and commented on it. He points out that this Resolution will be sent officially to the host state Delegations on Friday 28th March 2014 already announcing a possible mobilisation during the June 2014 Finance Committee and Council Meetings. At the President’s request, the Assembly demonstrated its support of the Resolution with much applause, sign which the President took as unanimous agreement. Then Michel informed the Assembly that an appointment has already been fixed with a lawyer whom he will meet along with a member of the executive committee of the Staff Association. Christian Roy requested written information to be sent to all staff members and pensioners; Gerrit replied that the staff members would be informed on the following Wednesday in a meeting with the Staff Association; the pensioners will be informed by the GAC-EPA website, by the Spring Bulletin and by the Minutes of this AGM. François Wittgenstein wished to make sure that our ESO colleagues would be associated with the procedure; Gerrit assured him that this would be the case. A member of the audience asked which Delegation is the instigator; Gerrit replied that it is the Austrian Delegation but that several other Delegations are in agreement. Michel Vitasse finished by underlining the necessity to be creative by making counter proposals; on this subject he made us aware of the fact that Austria, which practises the exoneration of income tax for ex International Civil Servants, is the instigator of the current problem; as a logical continuation, we could suggest that other Member States also adopt this practice and that eventually internal taxation could be applied to our pensions (which would lighten the revenue paid by the Pension Fund) as is the case for staff members. Gerrit Jan Bossen, President took the floor to present the report and said he would not make a detailed review of the committee members and their functions as there had been little change since 2012, a few details will be mentioned at the end of his presentation. He thanked all the committee members for their work and commitment over the last year. And in particular to ensure that the rights of retired persons, especially Social Security measures are protected (Pensions and Health Insurance). Our public website a technical overhaul of the entire site by our resident expert, Robert Cailliau, is in progress. Shortly the site will be linked to the corresponding ESO website. In passing, Gerrit remarks that Robert is looking for a successor, another voluntary computer specialist would be appreciated, any candidates can contact us directly. Members Forum: the Forum was set up at the request of a few members but after a year in service we have noticed that it is not used; the Committee decided to close down this facility. Paper edition of the Bulletin: this will continue to be printed twice per year in the spring and autumn; the next edition is foreseen end April-May 2014 as a bulk delivery with the Minutes of this AGM. Wider distribution of the Spring Bulletin 2013(No. 44) and of the Minutes of the AGM: We decided on an increased publicity of the GAC-EPA bulletin by distribution of the above documents to all Pensioners. Unfortunately the result of this has been somewhat disappointing and has provoked a cost overrun; in all only 50 new members were added to the membership. Better visibility of the GAC-EPA in CERN administrative (HR) documents on retirement: an interview took place between our President and the Director of Administration and we were reassured that in future new retirees will be made aware of the GAC-EPA’s membership. Unexpected help: Gerrit informed the assembly that the efforts of the Tax Centre of Bellegarde to impose taxation on pensioners for CSG and CRDS taxes have led pensioners to consult GAC-EPA; we shall come back to this point later in the meeting; our support to pensioners in this matter has led to a few new members. At present the membership of GAC-EPA is 1820 members which is more than half of the total retirees which stands at 3490 for CERN and ESO. Gerrit passed then to the subject which has given most concern to the Committee; it is not a surprise: the Pension Fund, the Health Insurance and Taxation and a more detailed account will be given later by each committee representative under PFGB, CHIS Board and Information Sessions. Pension Fund: the Fund is on the way to good health as the returns on investments are above the required 3% above inflation rates but we must keep an eye on it since these results do not constitute a guarantee; moreover, the Administrative Unit of the Pension Fund is lacking in a spontaneous and transparent action regarding requests for distribution of information about investments; the Fund has also been critisised by both the Italian Auditors and Internal Audit of CERN; and, as mentioned previously, the Pension Fund is again under attack. Taxation: a lot has been written and said about taxation over the last few weeks concerning the irresolute question of our pensions being subjected to the CSG and CRDS taxes in France. Gerrit wishes to thank Christian Roy for his help in writing a letter of request for exemption from these taxes to the French Tax authorities. This year the number of candidates was lower than the number of members to be elected (we hope this will not be a regular trend) both for the committee and for the auditors. This led the Committee to decide on tacit electorial procedure as we already explained in detail in our letter of 31 October 2013. The Chairman pointed out that details can be read in Bulletins nos. 45 (autumn 2013) and 46 (spring 2014). Françoise Thévenet has acquired a lot more work since as well as the tasks of Deputy Secretary she has taken on the role of Deputy Treasurer and looks after the updating of the membership list; she also gives our resident expert a helping hand with the updating of the website. François Wittgenstein did not wish to stand again in 2013 for election; the Committee thanked him whole-heartedly for all the work he has done over the past years to protect the rights of pensioners; François remains our linkman with the CERN Medical Service and with the University hospitals in Geneva. Eddie Roebuck similarly stepped down from office and we thanked him for his work as Deputy Treasurer and for conscientiously looking after the membership list. A non-committee member from ESO, Sandro d’Odorico, belongs to the working group on Health Insurance at ESO which is quite separate from the CERN working group. The Chairman, Bernard Ducret, thanked Gerrit for his presentation and all the information given. He called on Monique Häusermann, Treasurer, to take the floor for the next item on the agenda. Monique introduced the subject of the 2013 Accounts with a presentation of the Profits and Loss Account and the Balance Sheet. Monique pointed out the large increase in printing expenses due to the increased distribution to all Pensioners of the Spring 2013 Bulletin with the Minutes of the 2013 AGM. Monique will report later on the 2014 Budget and Membership Fees. The Chairman then asked Guy Salomon, Auditor, to present his report. Under the mandate that has been entrusted to me at the last AGM, I have proceeded with the auditing of the accounts for 2013. After checking, I found perfect agreement with the justifications at my disposal and the written accounting indicated in the books. I can but recommend to the present Assembly to give approval of the accounts to our Treasurers. I congratulate our friends, Monique Häusermann and her deputy, Eddie Roebuck, for their management, transparency and immaculate presentation of the accounts. The Chairman proposed that the Assembly approve the three preceding reports (Activity Report 2013-2014, Treasurer’s Report, Auditor’s Report) simultaneously. There was no opposition and no abstention. The three reports were approved unanimously with applause. The Chairman then asked Françoise Thévenet to present the next item. Françoise Thévenet, Deputy Secretary, presented the current list of scrutineers who were not requested to act in 2013 as elections were made tacit; she thanked them for remaining available for the next sorting of votes at the 2014 elections. There are 16 scrutineers and they are requested to continue, all having been reconducted in 2014 unless any of them wishes to resign by contacting the Secretary. If you wish to become a scrutineer: contact the Secretary after the meeting or send an e-mail to: secretariat@gac-epa.org (adress no longer in use/adresse plus en service), or write to the gac-epa secretariat. Françoise asked the Assembly to approve the list of scrutineers, this was done unanimously. The Chairman moved to the next point on the agenda and asked Claude Genier to inform us about the Pension Fund. With the table below he shows us the various Organisms involved in the Governance and their functions. In this structure, the PFGB role is dominant; he has to define the strategy management of the Fund and if results are not satisfactory, to fix a rectifying line. "Personnel" means the Administrative Unit of the Fund, whose Administrator is Théodore Economou, in charge of applying the define PFGB strategy. Several internal and external audit (Cour des comptes) services intervene, specific to the Fund itself, CERN and Members-States, to verify the regularity of the financial and administrative management of the Fund and of the procedures. In the chart below Claude shows us the net value evolution of our assets from January 2012 to end 2013; with a mild progression we have obtained to pass over 4‘000 MCHF. The page http://pensionfund.cern.ch/fr/investissements gives more information about the pension Fund Investments. The following tables give information on the assets outputs (7.76% in 2013) and on the distribution in the various investment products. He points out the important part of the Equities on the favourable level of the output. A CVaR (Conditional Value at Risk) of 5% at one year has been approved by the PFGB in 2012 on recommandation of the Placement Committee. The risk messure gives a average loss estimation with a probability of 5% to occur. The PFGB defines also each year a risk limit. In 2013, it was fixed at -8% for a CVaR of 5% in a year. The PFGB met 6 times and the Pension Commission nearly 20 times. We have to mention also the Pension Guarantees in case of dissolution of the Organization that Michel Vitasse will treat later. ESO Request: an agreement was reached between CERN and ESO to have only one referential currency (CHF) for the Fund management; the variation of the exchange rate during the career time will be take into account to determine the ESO member income. 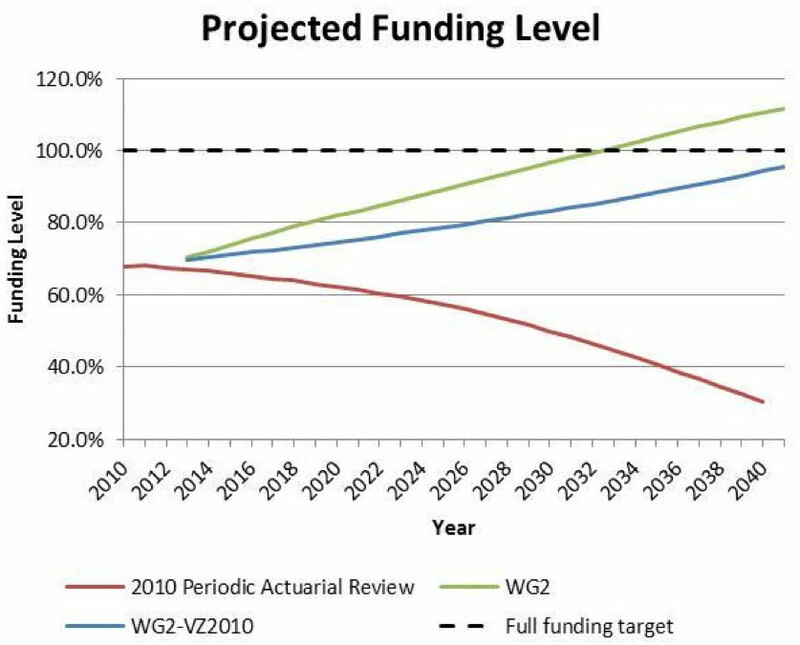 2013 Actuarial study: it is the most important point that touched the Fund as we can note by the reactions it provoked (see above: Attack on our pensions); note that the new Actuary based their first study on hypotheses that were not agreed by the PFGB. See table below: Actuarial study; The matter continues: despite the fact that PFGB accepted the second actuarial study, the CERN Council asked for other studies. Claude does not forget to mention in brief the audits that have concerned the Fund; there is a lack of transparency in Fund information under the “Cour des comptes” report: this aspect has often been pointed out by the GAC-EPA Committee without response. The CERN Internal Audit invited the PFGB and Fund Management Unit (PFMU) to follow strictly the rules in force of the Organizations; this has been accepted by these organizations. A group in CERN's GS department has been tasked to propose a suitable software package. This is the end of the report of Claude Genier, our PFGB representative. A member remarks that lack of information and management software have been mentioned in the past without results. Claude answers that we have a real hope for a suitable software package in 2015. Concerning the lack of information, he recognizes that, despite repeated requests from the GAC-EPA, we face a evident and inexplicable lack of will from the PFMU. A second member expresses his perplexity about the long term (30 years) actuarial study. Claude points out that actuarial studies are produced by experts and are reajusted every 3 years; of course, risks can’t be excluded. At this moment Christian Roy wants to intervene not about the Fund but concerning the CSG et CRDS taxes; if for pensioners without “Vitale card” the problem seems resolved, it is not the case for those who have the card, whether they use it or not; in the latter case, the French CPAM refuses to deliver the non-use justification asked for by the Fiscal Administration; Christian thinks CERN has to approach the French authorities to ensure concerned pensioners are able to cancel their "Vitale" card. Gertjan assures that this point is still on the agenda of the GAC-EPA Committee. A member asks who pays Fund properties taxes. Claude answers that the Fund pays these taxes. There are no other questions so Bernard invites Michel Baboulaz to present the next report. Michel started his presentation with a reminder of the principles governing our Health Insurance, recalling that it is CERN that is our insurer, that CHIS is the health insurance scheme run by the CERN Administration and that UNIQA (for now) is the third-party administrator of reimbursements. Mutuality. We are not insured by an insurance company, but rather by a small mutual fund of about 14'000 insured persons to which we contribute in proportion to our income, without any conditions attached to age, state of health or family situation. Worldwide freedom of choice of care providers. Members’ responsibility. Our fund must balance its accounts every year, the reimbursements that it makes must be balanced by members’ contributions and those of CERN. Any over-run of disbursements would result in an increase of contributions. The CERN Director General is responsible for the provision of health insurance cover for members of the personnel. This insurance is open to pensioners on a voluntary basis. CERN administration prepares and revises the Rules of the insurance scheme, monitors their application and the state of balance of the accounts. A committee with balanced membership, the CHIS Board, allows dialogue and exchange of views with the Staff Association and with GAC-EPA on the evolution of this Scheme (Régime in French). In the past, the CHIS Board has sometimes played an active role in proposing changes to the Rules, which were subsequently adopted by the SCC and then TREF. This poorly defined role was questioned by the External Auditors, who sought to clarify responsibilities. In 2011 the Internal Audit service produced a report on the functioning of the health insurance Scheme. At the end of 2012 the CHIS Board received a draft reply to the recommendations of this confidential report. The Staff Association then asked for and obtained a copy of the recommendations made by the Internal Audit. In the course of 2013 informal discussions took place. The place of the CHIS Board as a sub-group of the “Standing Concertation Committee”, the SCC, seemed to be confirmed but its mandate remained vague. In the end, its role has been reduced to the preparation of discussion in the SCC of proposals submitted to it by the Administration. It thus becomes the CERN Health Insurance Scheme Board, which remains the CHIS Board. In March 2014 a proposal for modification of the Rules of the health insurance Scheme has just been submitted for discussion in the CHIS Board. It concerns the functioning of the Scheme and should bring to a conclusion the revision initiated by the Auditors. Michel can only mention the 2013 Statistics, received (late) this month. More details will be given in the next bulletin. He expressed hope that they will be more complete than those of 2012. One thing that appeared certain was that, following the increase in subscription rates decided in 2010, which will continue until 2015, the income has exceeded the outgoings. 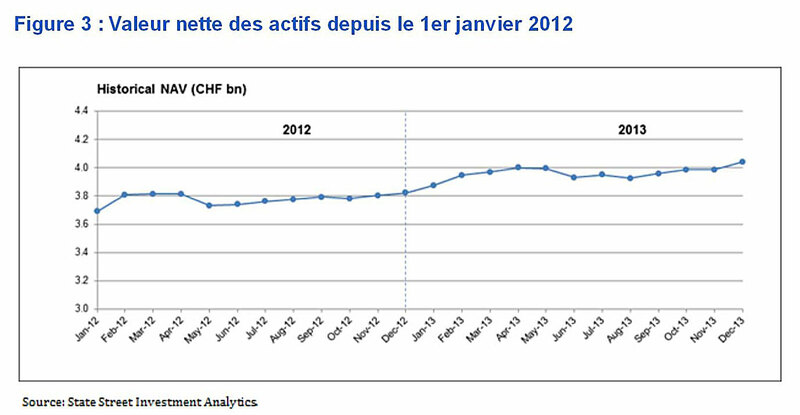 Thus in 2013 an income of 83 MCHF has been recorded against reimbursements of 68 MCHF. The administration contract of the Scheme, held by UNIQA since 2000, must be put out again for tender, as requested by the External Auditors. Begun in 2011, the tendering procedure for this contract is running very late. It was necessary to first complete an audit of UNIQA and then the editing of the technical specifications proved to be more difficult than expected. After consulting about 100 European firms, the 7 interested firms should now make their offer and a draft contract should be submitted to the Finance Committee for adjudication in June 2014. The new contract will start on 1 January 2015. It will concern the treatment of reimbursement requests (63275 in 2013) and the associated bills (165785 in 2013), in conformance with the CHIS Rules. Payment of treatment bills directly to the treatment providers by our fund. This is a recurring request with which it is impossible to comply as it could not be implemented in all countries, resulting in inequality of treatment. Besides, there would be a risk of patients becoming unaware and insensitive to the costs of treatments. Michel refers us to CHISBull 37 of May 2013, which, in its centre pages, lists the treatment providers approved by CHIS and recalls the roles of paying third-party or guaranteeing third-party that an insurer may play. CHIS, via its contract holder UNIQA, only undertakes this role of paying third-party for hospitalisations in approved establishments. As from 2014, the Grangettes clinic and the Bois-Bougy clinic in Nyon have been added to the list of approved treatment providers. Payment of reimbursements: as requested by the Auditors, CERN no longer transfers funds to UNIQA for payments to third-parties or insured persons, but rather receives the payment orders from UNIQA and forwards them to the UBS for execution on its own accounts. With this, Michel Baboulaz ended his report and Bernard Ducret asked Michel Vitasse to say a few words on pension Guarantees. After the optimism that he showed during the previous Annual General Meeting, Michel has to announce that the CCP Working Group created to examine this question has once again gone into hibernation. Thus no news from this, which is very disappointing. What Michel reported at the last AGM remains valid and can be referred to for information. However he does inform us about a legal opinion received in 2013, according to which the best solution for the Pension Fund to guarantee the pensions and the health insurance until the last surviving beneficiary, in the event of the dissolution of the Organization, would be to be absorbed by the Fund of another international organisation; this is a question which should be examined by the Pensions Commission. But Michel thinks there are more urgent matters to be resolved, even if this question is not forgotten; for him CERN, with its currently proposed projects, has a long future ahead of it, and it is this which, according to him, is our best guarantee for the future of our pensions, which we should not forget are guaranteed by CERN (and ESO) quite independently of the state of the Pension Fund. Bernard Ducret thanks Michel Vitasse and invites Jean-François Michaud to take the floor for the next subject. Note: the secretary recalls that Jean-François is one of the stalwarts who, with Gunilla Santiard and René Barthélémy, put great personal effort into listening to the problems of our members on the first Tuesday of each month (except January, July and August). Jean-François first thanks his colleagues in the Information Sessions group, as well as the Committee for its support in the steps to be taken concerning the problems posed by the pensioners. This is a team effort which he appreciates even if it is not always easy to give replies to the questions asked. If over the last 12 months, as reflected in the minutes of the 2013 AGM, the declaration of bank accounts held abroad (for residents of France) was one of the main subjects, at the end of 2013 this was replaced by the question of the French CSG and CRDS taxes, still a problematic subject. To this one can add several less thorny subjects which the group was able to resolve more simply. Concerning the bank accounts, one can refer to what was said during the previous AGM and Jean-François recalls in the following table certain points which have been mentioned in the Information Sessions. Concerning the CSG and CRDS taxes applied by the Bellegarde tax office to the CERN pensions of those living in Ain (and similar cases in some other Départements), this question is linked to the possession or otherwise of a 'Carte Vitale', that signifies membership of the French social security system. We asked the pensioners concerned to send a voluntary appeal to the tax office concerned (see also Bulletin no.45). Following this, for pensioners not having a 'Carte Vitale', it has not been difficult to obtain proof of non-affiliation to the CPAM, then to send this to the tax authorities and have the wrongly-applied taxes reimbursed. But it is not the same for pensioners having a 'Carte Vitale' (which they either asked for or received automatically), for the CPAM refuses in such cases to deliver the proof required by the tax authorities. We are in contact with a lawyer to try and obtain a solution to this problem. For those who use their 'Carte Vitale' and thus have the French social security as their main insurance, there is not, in principle, any alternative to paying the taxes, short of giving up the card in the future (if that is possible). Other questions asked are indicated in the following table. Can one remove oneself from the CPAM? Can one give up one's 'Carte Vitale'? Can one give up one's French pension? How can one prove the non-usage of the 'Carte Vitale'? Thus ends the report on the Information Sessions. Remark by Christian Roy: bearing in mind the complexity of the problem, he proposes that a Working Group be set up, of which he would be prepared to be a member; he also thinks that one should envisage, in certain cases, an appeal to the European Court of Justice. Gerrit Bossen assures him that this question will be discussed by the Committee. Bernard Ducret thanks Jean-François warmly and, seeing that there are no other questions, gives Gerrit Bossen leave to introduce the next subject. The following presentation by Gerrit informs us about the proposed activities of the GAC-EPA and its committee for the months to come. We are continuing our efforts to maintain a balanced budget and to encourage the joining of new members; a review of the organisation of the responsibilities inside the Committee will also be undertaken. We invite members to update their membership fees from 25 to 30 CHF/year. It would be useful for members to speak about the GAC-EPA to pensioners who are not members, since our work serves the latter just as well. Do not be shy in submitting your candidature for the next election in Autumn 2014; participating in making our Committee work well is rewarding! Gerrit adds some words about the Pension Fund, which is once more being put under pressure. We will continue to demand clarity in the management of the Pension Fund and will insist that all necessary information is supplied to us. We should again mobilise ourselves to oppose any attacks and we will make proposals going in the interest of the Pension Fund, as would be the case for internal taxation. We will try to find solutions to the recently-posed questions concerning the CSG and CRDS taxes. Health insurance will also be near the centre of our activities; we must remain vigilant to ensure that the role of the CHIS Board is not drastically reduced. On his side, the representative of ESO on the GAC-EPA committee will have to ensure that ESO assumes its responsibilities for its pensioners. Concerning the guarantee of the pensions and notwithstanding the slight change of direction arising from the presentation of Michel Vitasse, Gerrit is of the opinion that one should not allow the Working Group to go on sleeping; the subject is important, even more so seeing how attacks and challenges can arise without warning. Gerrit also mentions a possible social activity sometimes desired by members (organisation of excursions, travel, friendly meetings, etc. ); he is of course not opposed to the idea but the current burden of the work of the Committee does not permit him to move in this direction; nevertheless he remains open to any proposals from members desiring to involve themselves in such an activity; the Committee would support them using all means at its disposition. Gerrit thus concludes his presentation of the programme for the next several months. Bernard Ducret thanks the President and calls on Monique Häusermann to pass onto the 2014 budget. Monique Häusermann refers back to the table presented in the Treasurer's report and the anticipated income and expenditure. Bernard asks the meeting to approve the budget, which is done unanimously. Monique once again asks members to update their membership fees and, where relevant, to modify their banking instructions. No change in membership fee for 2015. A questioner asks how the fees of the lawyer engaged to reply to the attack on pensions will be paid. Gerrit replies that the part to be paid by the GAC-EPA will be taken from our savings account. A member has asked by email a question on the access by pensioners to and from CERN by the entrance/exit near the St. Genis roundabout; as time is short at present, Gerrit will send a written reply to the member in question. Gerrit Bossen, President of the GAC-EPA, then mentions briefly the celebration of the 60 years of CERN in 2014, and for which the support of the GAC-EPA has been requested; bearing in mind the current situation of the attack on our pensions, he expresses his reticence to taking part in the celebration of this anniversary alongside Member State delegations. And so ends the 2014 Annual General Meeting. ... but not quite, because you are now invited to take part in the drink of friendship. The President closes the meeting.